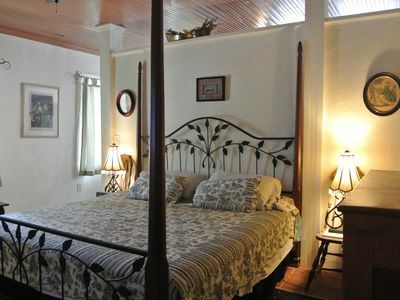 Intimate Log Cabin Studio - Perfection! 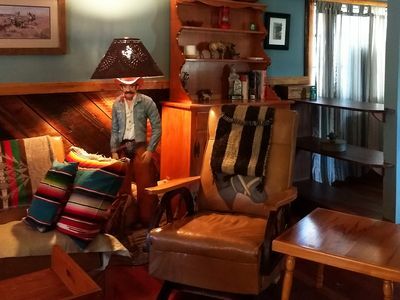 The Pinon log vacation rental is our version of a comfortably furnished, intimate southwestern studio-type apartment perfect for a single or a familiar two. At 430 square feet, this little cabin is big on ease. Perhaps our personal favorite, the full kitchen features custom-designed Italian stone counter tops, a 4-burner stove top, microwave, (2) apartment-sized refrigerators, coffee maker, toaster, microwave, toaster oven, crock pot/slow cooker, blender, dishes, flatware, cooking pots, utensils and a dinning bar with stools where you can enjoy breakfast, lunch or dinner. For your convenience, the pantry is supplied with complimentary items such as gourmet spices, condiments, spices, sugar, coffee creamer, tea, cooking oil and spray, pasta, rice, microwave popcorn, canned meat chunks, foil. A few miles from your cabin you'll find our local convenience store/gas station. They are stocked with fresh dairy products, eggs, ice cream, bread, canned fruits and vegetables, frozen meat, lunch meat, soda, snacks - open 7 days a week. The hotel quality queen bed beckons you to sleep in just a little longer than usual, all snuggled-up in the luxurious Egyptian cotton linens. When you do finally get up, the radiant, in-floor heating will keep your toes nice and warm on chilly mornings and, if you are here during the warmer months, you can count on the Air Conditioner to keep you cool! The living area in this quaint little gem features a comfortable Italian leather love seat with matching easy chair with plenty of throw pillows. There is a chest of drawers and vintage cedar armoire. This cabin also boasts a full bath, with shower and tub, and for the evenings when the star-studded sky isn&#x2019;t quite enough entertainment, there is also a TV/DVD library. 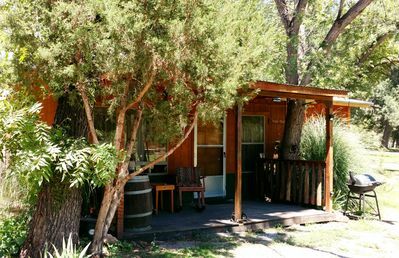 If your idea of relaxation is being exhausted from exploring Bear Creek Canyon, enjoying bird watching from your covered deck, hiking up Double E Ranch Trail or just enjoying the peaceful quiet, you&#x2019;ll want to stay at the Pinon Log Cabin. The Pinon Log Cabin really is at the end of the road. From your covered tin-roof deck, you can enjoy views looking toward Bear Creek and it giant cottonwood and sycamore trees, spy roadrunners, jackrabbits, hawks, deer, wild turkey or possibly javelinas. Take in some of the most stunning sunsets and star-filled night skies you could ever imagine. 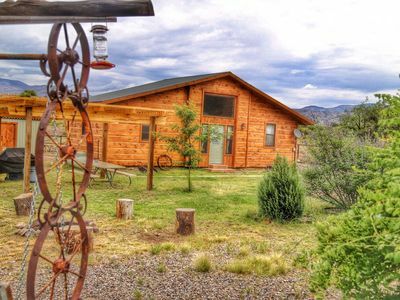 If you sleep better without the glow of city lights and prefer the night sounds of nature to the hum of humanity, then you are going to love the Pinon Log Cabin. 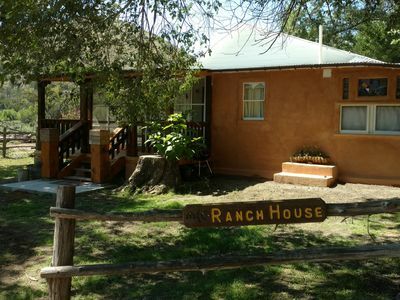 As with the other New Mexico Cabin Rentals properties, the Pinon Log Cabin provides you the opportunity to experience a taste of life on a southwestern New Mexico ranch, explore a diverse ecological region, and encounter the recent and ancient past up close. Enjoy the easy pace of a hot summer day on the ranch as you wander the compound and acquaint yourself with the horses. Look for any one of the hundreds of breeds of birds who call the Gila High Desert home as you challenge the summit of Turtle Rock or explore the canyons of the Double E Ranch. Trace the path of the Mimbres Indians who lived along Bear Creek and the Gila River 1300 years ago. Uncover their history through pottery pieces, ancient tools, pictographs and remnants of stone dwellings which can still be readily found along Bear Creek. Introduce yourself to the more recent legendary characters who roamed the hills, mountains and towns in this area, including Billy the Kid, Geronimo, and Ben Lily. Fill your days and evenings with whatever pleases you because out here, that&#x2019;s just about the only person you&#x2019;ll have to answer to. We're proud to be an Airbnb Super Host! 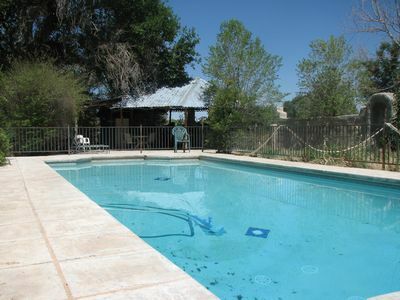 Cozy 2-Bedroom Near Creek, Sunny Southwest New Mexico! 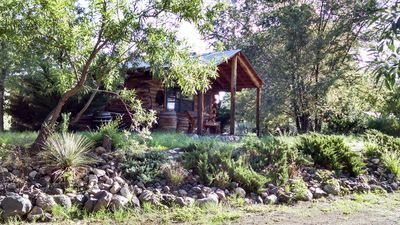 Cottage on Rural Southwest NM Ranch, Along Creek!